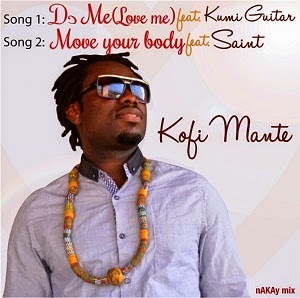 Kofi Mante is back for his music lovers. After releasing Yen Da which features SK Originale and Make You Happy featuring Mohamed, the Canadian based Ghanaian artiste drops these new songs that will entertain and make people fall in love. The song titled Do Mi which in English Means (Love Me) features Nana Yaw Kumi popularly known as Kumi Guitar of Break Into Two fame. A very classic highlife with deep words from both artistes. Followed by Move Your Body which features Saint,these two artistes joined forces together to produce a South African kind of dance music for their music lovers out there. All songs were produced by fast and up coming sound producer, nAKAY. Kofi Mante says he is in to stay. Check out his foist offerings below..